In spring 2015, Stockholm County Council presented us with the challenge of creating an economical model that would incentivise the purchase of environmentally friendly products. To enable the creation of innovative ideas and solution, Design Thinking was the approach in which the project was carried out. During the first phases of design thinking, we realized that the issue was not only constraint to the lack of monetary incitement, though also an inadequate communication between actors and motivation proved to be equally as important to focus on. The challenge was broaden to focus not only on money though also communication and motivation. During half-time concept delivery, four concepts were presented. The concepts were narrowed down to one final concept through brainstorming and discussions, taking the feedback given during presentation into consideration. Finally, one concept was chosen and the design process started again. With the one concept chosen, we collected more information in order to deepening the concept and our understanding of the context in which the concepts is situated. The final concept EcoFlower / Miljöblomman focuses on the need for motivation and communication between staff, Stockholm County Council and the public with hope in changing the market for environmentally friendly products. EcoFlower builds on the idea of a public competition between hospitals within Stockholm County, thus increasing the purchasing of environmentally friendly products. 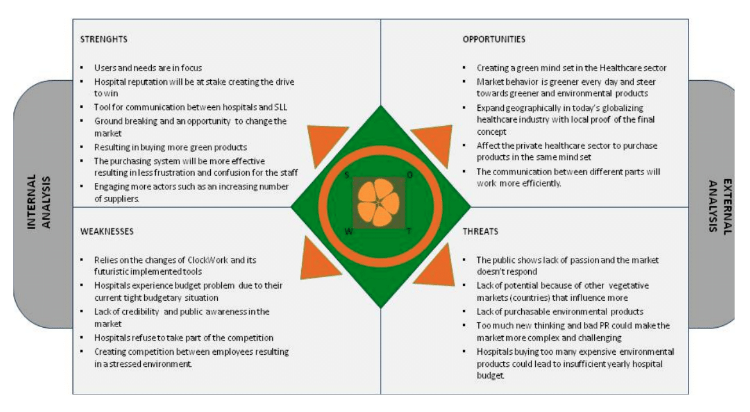 With the created EcoFlower chart combined with our PR-strategy, we believe that EcoFlower has the potential to change the market for environmentally friendly products and unify hospitals towards an environmentally friendly health care.